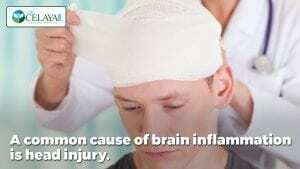 One common cause of brain inflammation is head injury. Injuries cause immune cells to turn on in order to begin the healing process. But unlike immune cells in the body, the brain’s immune cells do not turn off. This means brain inflammation can continue to be a problem long after the injury. This is one reason football players have high rates of the chronic degenerative brain disease called chronic traumatic encephalopathy. Other common causes of brain inflammation include chronic inflammation in the body, leaky gut, high blood sugar and diabetes, hormone imbalances, hypothyroidism food intolerance (gluten notorious to cause brain inflammation), stress, and brain autoimmunity — a disorder in which the immune system erroneously attacks and damages brain tissue. It is more common than people realize. 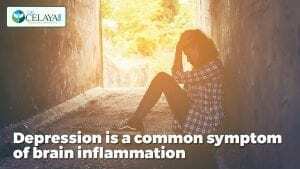 Depression is a common symptom of brain inflammation (although different things can cause depression, depending on the person). 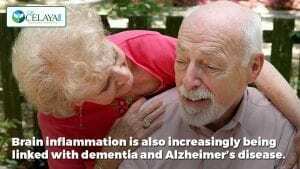 When a cell is damaged or injured, it releases chemicals called cytokines which signal a inflammatory response to repair issues, but these cytokines also hamper the activity of serotonin, the “joy and well-being” brain chemical commonly linked with depression.